Readerware 4 beta 3 is now available. What's new in 4?, an in-depth look at some new features found in Readerware 4, upgrade pricing and more. Firstly thank you all for your feedback on the Readerware 4 beta releases. We appreciate your feedback and the problem reports. We actually have two new Readerware releases to tell you about in this newsletter. Readerware 4 beta 3 is now available. This fixes several problems you reported in the last beta. The earlier Readerware 4 Beta releases will expire shortly so if participating in the Readerware beta program, you should upgrade now to Readerware 4 Beta 3. A full list of the changes included in Readerware 4 Beta 3 is available in the release notes. You can also access the release notes from Readerware itself, select the Help->Release notes menu item. We anticipate that this will be the last Readerware 4 beta release. Everything is looking good with Readerware 4 and the goal is to officially release Readerware 4 before the end of the month. We have also just released Readerware 3.63. There was an issue that could cause excessive CPU usage in Readerware 3.62, so this release is recommend for all Readerware 3 users. A few of the issues reported with the Readerware 4 beta were actually in Readerware 3. So we have also fixed them in Readerware 3. A full list of the changes included in Readerware 3.63 is available in the release notes. If you are upgrading from an earlier Readerware 4 Beta release to Readerware 4 Beta 3, you just need to install the new version. There are no additional steps you need to take. If this is the first Readerware 4 beta release you are installing, you do need to convert your existing Readerware 3 databases. Your existing databases need to be converted to the new Readerware 4 format. This will happen automatically when you start the program or open a Readerware 3 database. Readerware will recognize that the database is in Readerware 3 format and offer to convert it. The conversion is a copy process, Readerware will backup your Readerware 3 database and restore it to Readerware 4 format. Your existing Readerware 3 database is not touched. You can also create a new empty database for testing if you prefer. Readerware 4 will be installed in a separate folder so it can exist on the same system as Readerware 3. Because both the program and databases are separate you can continue to run Readerware 3 alongside Readerware 4. Readerware 4 can restore a Readerware 3 backup file to create a new Readerware 4 database. So if you would like to test Readerware 4 on a different machine, install it on the new machine and then restore your latest Readerware 3 backup file. You will have Readerware 4 and all your data on the new machine. There is a new e-mail address for beta support, e-mail beta@readerware.com if you need any assistance with the Readerware 4 beta or have any feedback. As Readerware Mobile is installed from the appropriate app store, there is no beta version of the Readerware Mobile programs. However you can use Readerware Mobile 3 with Readerware 4. Before you install the Readerware 4 beta, there is one important thing to understand. As part of the conversion from Readerware 3 to Readerware 4 we copy your existing Readerware 3 database and convert it to the new Readerware 4 format. If beta testing reveals that we need to make further changes to the database format, we will not be providing a database conversion for the beta database. Instead you will need to go back to your Readerware 3 database and convert it again. Any changes you made to your Readerware 4 database during the beta will be lost. Firstly, there is no need to upgrade now in order to run the Readerware 4 beta. It will run in evaluation mode for the duration of the beta period. The upgrade to Readerware 4 will be free for all users who purchased Readerware 3 or upgraded to Readerware 3 on or after January 1st 2017. This is a lot longer than our official upgrade grace period and is for Readerware 4 only. If you are eligible for the free upgrade send your upgrade request to upgrades@readerware.com Please include sufficient information so that we can locate your original order and send you new registration codes. During the beta period we are offering a 20% discount on any upgrade order. Just enter coupon code Beta20 at checkout and your discount will be applied to your order. The coupon code will expire the day Readerware 4 is officially released so make sure you order soon to get your discount. You will receive your new Readerware 4 registration code right away. If you order a CD, that will be shipped as soon as the official release is available. As mentioned earlier we anticipate releasing Readerware 4 before the end of the month. So time is running out for your 20% discount on the upgrade. Here are the highlights for Readerware 4. Later in this newsletter we take an in-depth look at one of the new features, how you can rename the Readerware database columns. New advanced search capabilities. Search on multiple fields and conditions. You can perform negative searches, search for date ranges, empty fields etc. 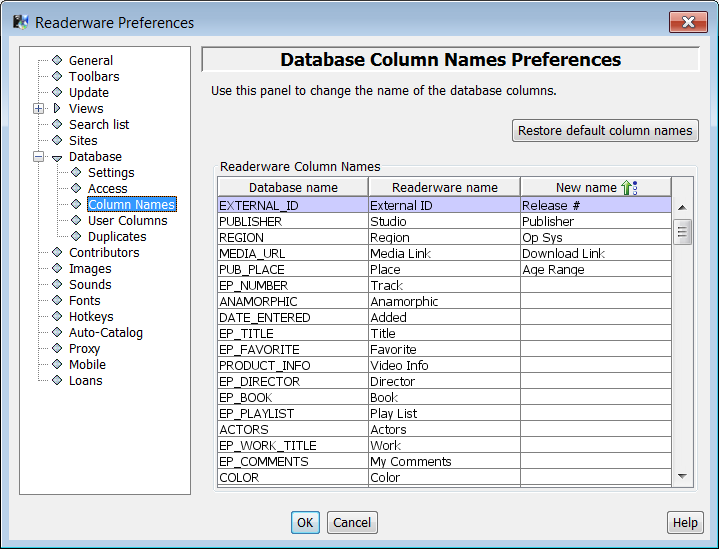 Next up on our look at the changes coming in Readerware 4, is how you can rename the Readerware database columns. This has been a common request from Readerware users. The first question is probably why would you want to rename the Readerware database columns? Readerware has three programs for books, music and video. Each program is customized for the media type, the database column names are appropriate for books, music and video. Maybe some column names just bug you. For example in Readerware for books we have a column where you can enter the condition of the cover, we call it the Cover column. If you prefer the term Jacket, you can now change that. Some users use Readerware for cataloging other items. They pick the product that is the best fit for the items they are cataloging and map the data into the standard column names. Many users have mentioned that they are using Readerware to keep track of their software. Many of the fields map into existing fields, title, format, publisher etc. Other fields like operating system, release number, are more of a challenge, there is no obvious place to put them. You no longer have to map the fields in your head, you can rename all the database columns. The first thing to understand is that the columns are renamed in the current database only. The new names are stored in the database itself. So you can have multiple databases, each with different column names. Your video database will still have Studio and Region columns, but your software database will now have Publisher and Operating system columns. Start by creating a new database for your software, select the File->New database menu item. It is easy to rename the database columns, select the Preferences menu item, then expand the Database node and select Column Names. You will see a table with three columns, Database name, Readerware name and New name. You can sort on any column, just click on the column header. By default the table is sorted on the Readerware name column. To setup your software database you want to add these columns to the table view along with any others you think are appropriate. You will also want to setup the list columns. You have always been able to customize the list columns in Readerware. You can edit the list columns by selecting from the Edit->Database Lists menu item. As this is a new database, some lists will be empty and you can just add the values you want. Other lists like the region and format lists will have default values in them. Here is a quick tip, click on the Clean Up button in the List Column Editor to remove all unused entries. As there are no records in this database yet, that will be all of them. Now that the list is empty add your values. Readerware uses the name you assign to the column in the views, search list etc. Notice that I mapped the Readerware Media Link column to Download Link and I entered the URL for the program download page. The Media Link column lets you enter or select a web page, local file etc. When you click on the Play button at the beginning of the field, Readerware will open the download page in your browser. When you decide to rename a column, it is important to pick a column of the correct type, a list column, a date column, a price column etc. It is also a good idea to keep the new name about the same length as the Readerware name to eliminate display problems. Each column name must be unique, you will get an error if you use the same name for multiple columns. If you ever need to reset the database back to the standard column names, click on the Restore button. Hopefully this has shown you how easy it is to rename Readerware database columns, whether it is to just change a single column to the name you prefer or multiple columns to handle different products. If you would like to review the documentation for Readerware 4 before downloading the beta, it is available on the website. If you would like to participate in the Readerware 4 beta program, you can download the latest beta release. This beta release will expire on October 15th 2018. We will either release Readerware 4 before then or have a new beta version available. So there will be no interruption. We anticipate the official release of Readerware 4 will happen before the end of the month.